This post will cover basic installation and configuration of Oracle 11g Express Edition (XE) on CentOS. We will also take a quick look at configuring Application Express (APEX) for 11g XE. Basic installation is straight forward. If you just want to get up and running, you can just do steps 1 to 4 below (and 10 and 11 for Apex). The remaining steps (5 to 9) cover basic backup, recovery, and performance configuration. Your CentOS box should have swap equal to 2xRAM. On every CentOS installation I have done for XE, I just needed to update/install the packages for libaio, bc, and flex. When installation completes, run '/etc/init.d/oracle-xe configure' to configure and start the database. Unless you wish to change the ports, except the defaults and set SYS/SYSTEM password. will be used for database accounts. Press  to accept the defaults. The installation created the directory /u01 under which Oracle XE is installed. Replace localhost above with your IP or domain as required. Log in as SYSTEM using the password you selected in Step 2 above. To protect against disk failure, you should move the Flash Recovery Area to a separate disk. If a separate disk is not in your budget you should, at the very least, move the Flash Recovery Area to a partition other than the Oracle installation directory. Now, change the DB_RECOVERY_FILE_DEST to the location you selected above. Now, set an appropriate size for the Fast Recovery Area. Use df -h to insure that there is ample space. Verify the new location and size. You should have at least two Redo Log Groups and each group should have at least two members. For whatever reason, only one member is created per group on install. Since the default location for the two members is the Flash Recovery Area, the two existing members have been moved to our new FRA. The default values for parameters and sessions is quite low on the default installation. You can increase these parameters. After each change, you will need to restart the database. Increase sessions and then bounce database. To enable online or "hot" backups, Archivelog Mode must be enabled. Copy the backup.sh script from /u01/app/oracle/product/11.2.0/xe/config/scripts to the directory you created above. echo Backup of the database succeeded. echo Log file is at $rman_backup_current. echo -n "Press ENTER key to exit"
#echo -n "Press ENTER key to exit"
The line we added above, mail -s 'Oracle Backup Completed' 'david@davidghedini.com' < /u01/app/oracle/oxe_backup_current.log, will send us an email notification that the backup has completed as well as cat the backup log to the body of the email. Note that we have also commented out the last two lines of the script (the prompt). Create a cron job to run the script as user oracle. You should run it at least once a day. With Archivelog Mode enabled, it is important that backups be taken regularly to prevent the Flash Recovery Area from filling. Oracle 11g Express Edition comes with Application Express 4.0.2 already installed. If you elect to upgrade to the latest version (4.1 as of this writing), you can do so but will loose access to the XE GUI. Not a huge loss, but something to keep in mind. Although Apex is already installed, you will need to set the Internal Admin password. Note: pick something simple like Password123! as you will be prompted to change it on first log in anyways. Password: (whatever you selected above). Again, replace localhost above with your IP or domain as required. Unless you have a license for Oracle HTTP Server (OHS), your options are the embedded PLSQL Gateway (EPG) or Apex Listener. The Application Express that comes installed with Oracle 11g XE is configured using the EPG. While the EPG is simpler than Apex Listener, it can be painfully slow as of Apex 3.2. Apex Listener, while quite fast, adds an extra layer of complexity. You will need to install an application server to run Apex Listener. I have run Apex Listener on both Tomcat (unsupported) as well as Oracle GlassFish 3.x (supported) and was not impressed with either. A lot of people who know far more than I do about APEX (read: 99.9999% of the population) like the Apex Listener. Apex Listener and it's installation guide can be found here. The Apex Listener installation guide is well done and simple to follow. If you need to install Oracle GlassFish or GlassFish CE (basic installation is the same), you can use my GlassFish 3.1 instructions here. If you want to be an outlaw and use Tomcat, you can use my Tomcat 6 installation guide here. or my Tomcat 7 installation guide here.. 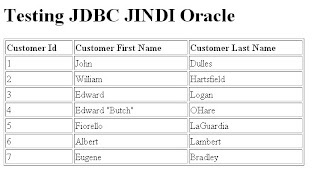 This post will cover connecting your Tomcat web application to Oracle via JDBC using Tomcat's JNDI emulation ability. In our example, we'll create a connection for an application in the Tomcat/webapps/ROOT directory. We'll also do the same for an application in a directory other than ROOT (e.g. Tomcat/webapps/myapp). In our examples below, I have installed Tomcat at /usr/share/apache-tomcat-6.0.29. Adjust this to your Tomcat installation as required. 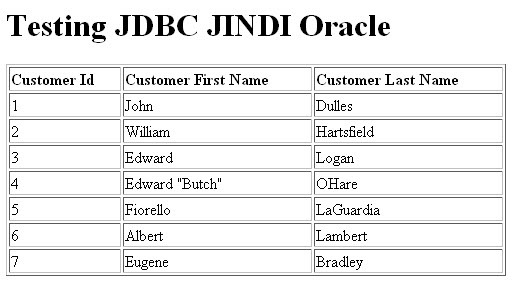 First, let's create a simple test table in Oracle. Now, let's populate it with some data. Both ojdbc6.jar and ojdbc14.jar will work for this example. Additionally, since I will be using JSP Standard Tag Library (or JSTL), I will also need to download standard.jar and jstl.jar, which you can download here. By placing the drivers in the TOMCAT_HOME/lib directory, we are making them available to all applications. Since we are using the ROOT directory, we will be using /usr/share/apache-tomcat-6.0.29/conf/context.xml. Replace the url, username, and password above with your own. I've used 'oradb' as my resource name. You can use whatever you like. 4. Add a Resource-Ref to our web.xml file. 5. Create a JSP page to test our set up. 6. Locations when using directory outside of ROOT. If you web application does not live in the ROOT directory, you can apply the above to using the following locations within your application. For an application called "MyApp", for example, you could use the following locations. If any of the directories or files above do not exist, you will need to create them. Again, you can leave the drivers under Tomcat/lib if you want them to be available to all applications. Export the Scott schema on a daily basis using Data Pump. Write the contents of the log file into the body of an email. FTP the file or attach the file to the email and send it. To begin, you will need to create an Oracle directory to export the file to and then grant read and write on the directory for the schema. In the first part of the script, we set the required environment. cat /home/app/oracle/admin/orcl/dpdump/scottLOG-$(date +%Y%m%d%H).log writes the contents of the log file into the body of the email. "Scott Backup" is the email subject line. -a /home/app/oracle/admin/orcl/dpdump/scott-$(date +%Y%m%d%H).zip attaches our file to the email. scott@tiger.com is the recipient address. Write the contents of the log file into the body of an email notification. Finally, we go our backup directory and FTP the file in binary mode.